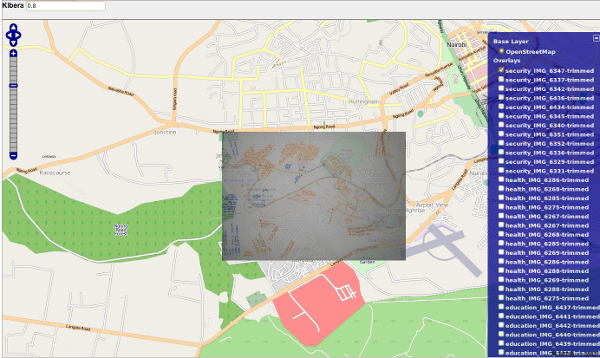 Map Kibera’s focus is online, but net access and technical knowledge is Kibera is still a big challenge. 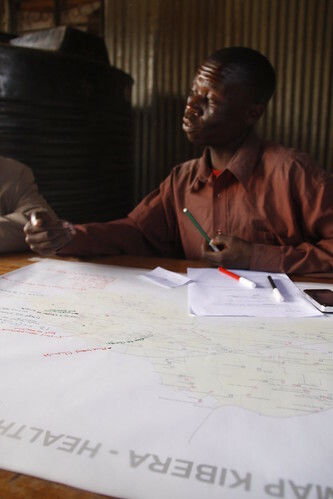 This is why our plan has always been to print up large number of maps (or an atlas) and distribute to all the schools, organizations, clinics, churches, whatever in Kibera, so the work of Map Kibera has maximum exposure and impact. 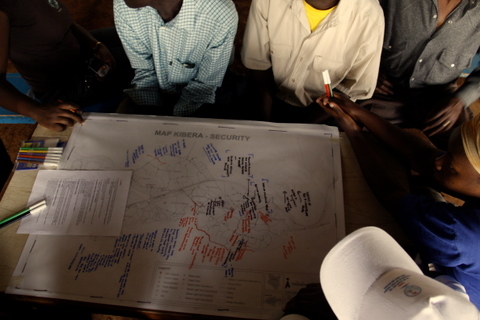 We’ve also been holding community meetings that feature paper maps. This is very much like what’s called Public Participatory GIS. That decade-old-plus methodology intends to bring mapping to a wide audience, through discussion and map drawing, or sometimes using some lightweight digital technology. The idea is not to capture precise information, but more subjective experience and ideas around place. But now with web mapping, and particularly OpenStreetMap, the public is simply participating, and the line between precise and subjective information is blurring. Still, paper and hand drawing is a powerful tool. Walking Papers is the prime example of that. As we have moved into the community meetings, we wanted to capture this hybrid … subjective, familiar experience, but in a toolset that leads to easy digitization, reuse and sharing of results. I would’ve previously critiqued PPQIS for the lack of re-use … the results often disappeared to a desktop or report. What we came up with here was much inspired by Local Ground (pdf), which used modifications of Walking Papers to bring paper drawing in Bay Area high schools online. All the dirty details on our organizational process for this is in the wiki. Here I wanted to document the technical process, and highlight a couple areas for improvement. But if you’re simply curious to see the early results, take a look. 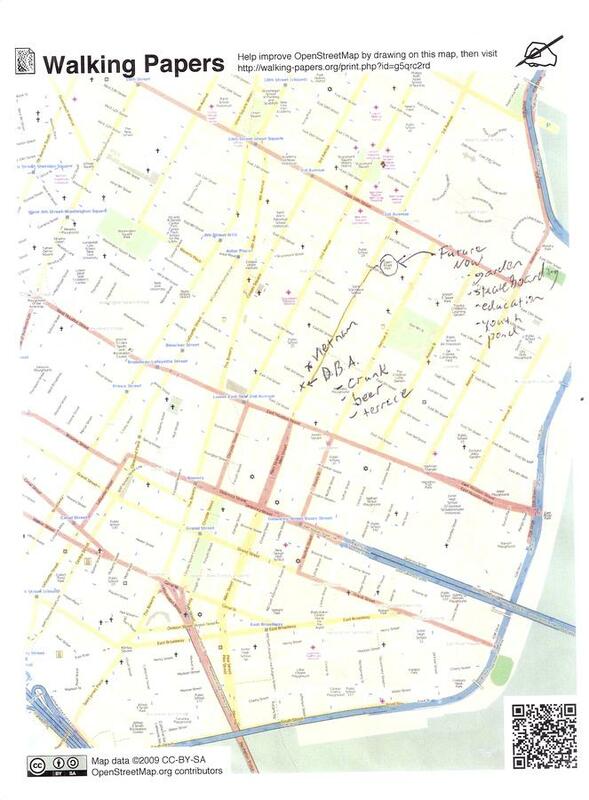 We start off by printing maps by generating a A1 sized pdf map, using an extract of OSM data on whatever theme. Those get printed down in Nairobi’s industrial area, small run of 5 prints, costs about $10 each (we could probably do better if we had time to bargain). We buy good quality tracing paper from the stationary store in >Westgate. We have sets of colored markers; each marker is associated with a kind of question during the session. At the meeting we tape down tracing paper on top of the map print, and draw a line over the border of the map and the north arrow. Discussions are led by mappers and us coordinators, a writer is chosen, and the mapping commences. The quality and revelations of the meetings have been amazing, Besides the written map, everything is documented by video, photos, audio, and write ups. We’re still compiling everything, but this page on security shows a preview. We roll up all the maps for transport home. Unroll, and each tracing paper is affixed to the wall, backed by the blank opposite side of one of the paper maps. The map is photographed with a Digital SLR on a tripod, with flash, at a distance that reduces parallax as much as possible. Once a suitable image is captured, that’s copied to the computer. The image is clipped to the drawn boundary (this is sometimes a little bit of an art), and uploaded to the server. Also placed on the server is a “bounds” file, which simply contains the west,south,east,north bounding box of the map. The result is pretty decent, and very close to the mark. It certainly could be improved, if we had a large scanner, but that’s not available. Alignment, lighting and parallax introduces distortion. Could automatically extract the writing, like Local Ground does with PIL, but for now simply allow for altering transparency of the entire image in the display. The background tiles should be customized to the theme. Some of the text lies outside the clipping area, which could be solved by simply recording registration marks of the four corners. Perhaps with Walking Papers properly integrated, this would be easy. Finally, we’ll be integrated the drawn maps into pages included narratives and media, with links that highlight OSM features in browser. A VOLUNTRY ORGANAISATION FOR SC/ST 7 RURAL POORS.